Matchbook is building solutions to turn around failing schools. Using a variety of different models, we give educators the tools they need to transform their learning environments and put their students and their schools on the path to success. We serve as the Charter Management Organization, taking over a troubled school and changing the culture and the learning model under our own control. We provide virtually the same tools through direct and indirect partnerships, using our Matchbook Accelerator model. Our vision is to partner with principals and emerging leaders across the country who are turning challenged schools into promising ones. Together with Matchbook Learning, your school can provide a powerful program of equity driven learning, capable of multiple measures for career and college readiness. Currently, no sustainable, scalable turnaround solution exists for our nation’s public schools. We intend to change that. The startup industry has birthed a new model in recent years to help level the equity challenges among emerging entrepreneurs as they build their vision, team and business known on an accelerated timeline. 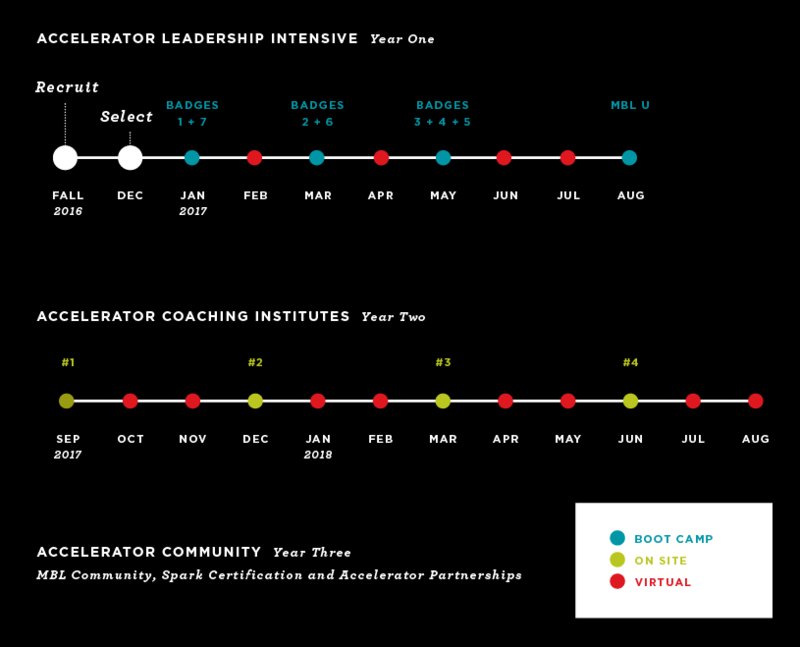 Accelerator is the term used for the immersive experience of being mentored by organizations and funders in a cohort format for a specified period of time that provides access to the various design partners and mentors, a cohort of like-minded entrepreneurs, a business model and plan for refining and launching process, and alumni inclusion into a wider ecosystem of learning support. In our Matchbook Accelerator, principals and aspiring leaders at the school will go through an intensive, six-month experience that is anchored in our badging system and is tied to milestone funding. Co-design a six-month Matchbook Accelerator fellowship that trains and builds the capacity of your school's four person leadership team. They will learn how to use Matchbook’s design principles, targeted metrics, methodology, and Spark technology platform to transform the school into a 21st century, competency-based, project-based, student-centered, personalized, blended model of school. Build a school transformation plan complete with academic, equity, operations, finance, human resources, technology and professional development components that are integrated and fit within your per pupil fiscal resources and local constraints. Monitor the success of the transformation plan and its set student academic growth goals annually, with monthly feedback cycles therein. Continue into a second year cohort focused on multiple measures that ready the accelerator for scale and sustainability for the following school year. By year three, provide light coaching assistance on our competency-based platform, Spark. Year one structures will include four in­-person boot camps, with three in either Detroit, Michigan or Newark, New Jersey and the final one occurring at the school site. These sessions will be for approximately 2-3 days in duration each, with a minimum of one virtual connecting point per month between these four in-person boot camps. At the conclusion of year one, the school should be ready to launch its own customized version of Matchbook Learning's school transformation model. Matchbook will also host an annual gathering of School Partners as well as partners from across the country that have participated in Matchbook Learning's Accelerator Program to provide best practice sharing, updates to the Spark technology platform and Matchbook Learning's methodology and provide an ongoing community of practice for national replication and growth. Our design teams include school leadership, Matchbook personnel and user groups of students and parents. All four teams will be integrated into the timeline of events below. Every student navigates a personalized learning path that is unique to their competency level for each subject, independent of their age or grade level. The Matchbook "GPS Board" guides students step-by-step from where they are to where they want to go by demonstrating applied mastery and exercising their own agency over their learning, resulting in higher accountability. This is a new kind of turnaround classroom model for a new kind of learner. Our teacher model is captured on our custom technology, Spark. Learn more about the model. The technology ecosystem at the core of the Matchbook experience is Spark, a student-centered and teacher-driven tool that uses customized starting points, multiple learning pathways, and mastery-based progression through applied projects. This is more than a learning management system: it monitors, integrates, and manages both student and teacher performance. Spark also captures evidence of adult learning, as exemplified by our badging system. Learn more about Spark. Matchbook Learning is building an innovative system of microcredentials to support our educators and school staffs to gain validated recognition for the skills and competencies they learn throughout their careers. The system allows educators to submit evidence, have it reviewed by experts and peers, and earn digital certification of specific competencies. Learn more about badges. To learn more about the accelerator and request an application and program requirements today, please complete the form below. Signup to learn more about the Matchbook Learning Accelerator program.